Since the days of the ancient Egyptians to beauty eye-cons like Marilyn Monroe and Twiggy, women throughout history have experimented with cosmetics, eyelash extensions, curlers and more to give their eyes stopping power. Today, the revolution continues with the newest innovation in medical aesthetics. LATISSE™ (bimatoprost topical solution 0.03% w/v), the first-of-its-kind prescription eyelash growth product clinically proven to grow natural eyelashes longer, fuller and darker, is now available in Canada. LATISSE™ is the first and only prescription eyelash growth product indicated in Canada to grow natural eyelashes longer, darker and fuller. It is applied once-daily to the base of the upper eyelid margin. Lashes grow gradually over time with most people beginning to see longer lashes in about eight weeks, with full growth at 16 weeks. Research shows more than 50 per cent of Canadian women want to grow their own natural eyelashes longer, thicker and darker. Moreover, this research has confirmed what history has already shown us: women overwhelmingly believe the eyes are important markers of beauty. Seventy per cent of Canadian women believe big, bright eyes and long, dark, full lashes are the main facial features that define a beautiful face. As well, research shows having longer, fuller and darker lashes makes women feel more beautiful, glamorous and confident. Once treatment with LATISSE™ is discontinued, over a period of several weeks to months (average eyelash hair cycle), eyelash prominence will return to pre-treatment levels. 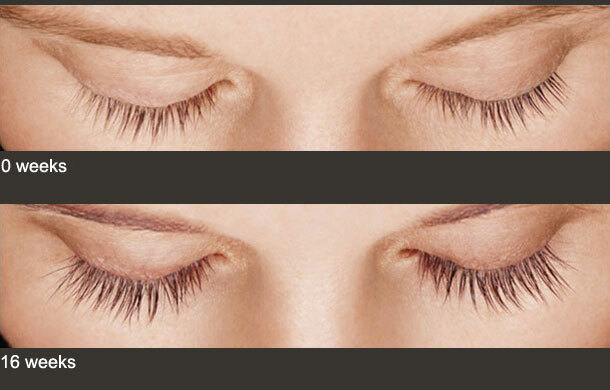 Therefore, to keep lashes looking luscious and beautiful, continued treatment with LATISSE™ is necessary.